Music recorded by the band that features in Silent Music​ is now available here. Tags: Music, dreams, memory, Derrida, hauntology. "This is a novel about time and regret, verbally exuberant, yet centring around moments quite beyond language. “The music has ended, remaining a memory, a silent music you once called it, that small space between the last note and the first pair of hands closing together”. Here is a fiction cunningly structured as musical form, a free form concerto, with prelude and coda..."
"Wolfreys excels at conjuring up landscapes, colors, sounds, shifts of light. The Isle of Wight has surely never had such a fine praise-singer." 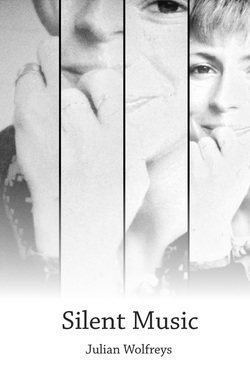 Silent Music is a ‘theoretical’ novel that explores through its narrative and the central analogy between love and music, several themes now common to literary theory and interdisciplinary studies working at the intersection of memory studies, psychoanalysis, philosophy, historiography, rhetoric and poststructuralism. Silent Music is not a theoretical novel; it's a devour-it-in-a-weekend book that threatens to empty you out when you read it, leaving you reaching for something you've lost, a bit ghostly/ghastly, not quite as sure of your self or your ground as when you started out on the book. If you like the way fresh scones melt you should read it. The novel, which moves between 1976-1983, and between the Isle of Wight and northern Europe, is about identity and Being. The first half describes a series of ‘first encounters’ between the main characters and details the developing relationship between Annagreth and Benedict over a few weeks in the summer of 1976. The second half of the novel relates the story of their relationship, her part in the band, and the band’s progress and fortunes. Silent Music tells of meetings and beginnings, of the formation of the band, the makings of a romance, her becoming a member of a band, and tells tales of family gatherings, recording sessions, touring, birthday and Christmas parties, along with incidental events that assume significance over time as the story reaches its climax, bringing to an end both the band and its hopes. Written in a style that pays as much close attention to the crafting of anecdotes as it does to the terrible importance of the narrator’s memories thirty years after the events of the novel, Silent Music presents a striking elegy to the enduring nature of love. The novel draws on the philosophy of Jacques Derrida and related theorists of phenomenology, exploring questions of Being, self and other, identity, the relationship between self and place, and what Derrida calls ‘hauntology’ with its implications for memory, historicity and ethics, through the narrative. Silent Music offers a significant departure from traditional critical studies of the work of Derrida and related theorists. Rather than applying theory to literary texts, here is a literary text that embodies the thought in an accessible, immediate and moving fashion. Not only is the originality of the work in its being a novel, but structurally at various ‘invisible’ levels, the novel is constructed with reference to different musical and poetic forms, such as the elegy, the lyric and the sonata. General readers of literary fiction, academics working in the humanities and social sciences, teachers of literature, students from undergraduate through to doctoral level. Sunday afternoon sofa-dwellers with a love of tea, biscuits, music, sentiment and the Isle of Wight.